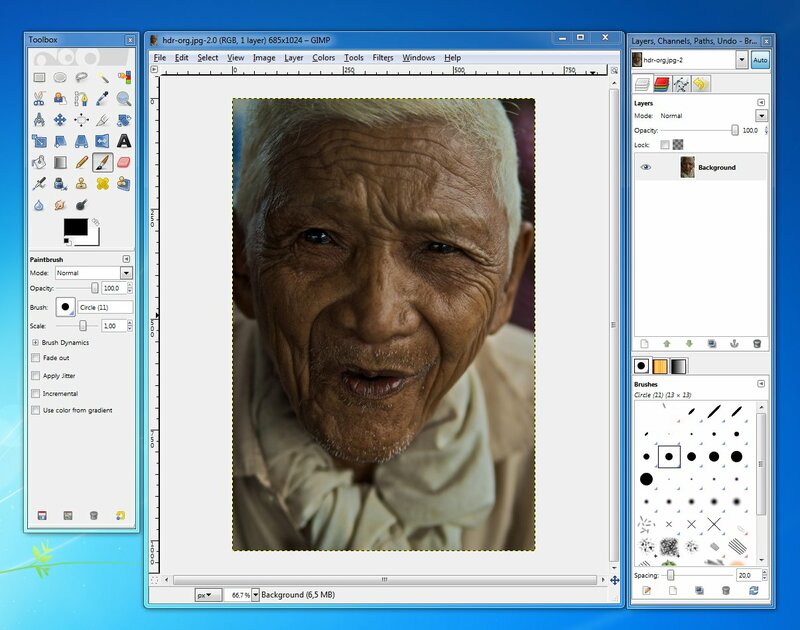 Duplicate the background layer and give it an appropriate name, I choose “unsharp mask”. With the new layer selected, apply “Unsharp mask” filter. (Filters > Enhance > Unsharp mask). Start by raising the Radius value to a point where the details really start to become visible. I choose a value of 80. Then raise the “Amount” value slowly and see how it affect the colors of the photo. I stopped at 0.75 which I felt looked good for the effect we’re after. 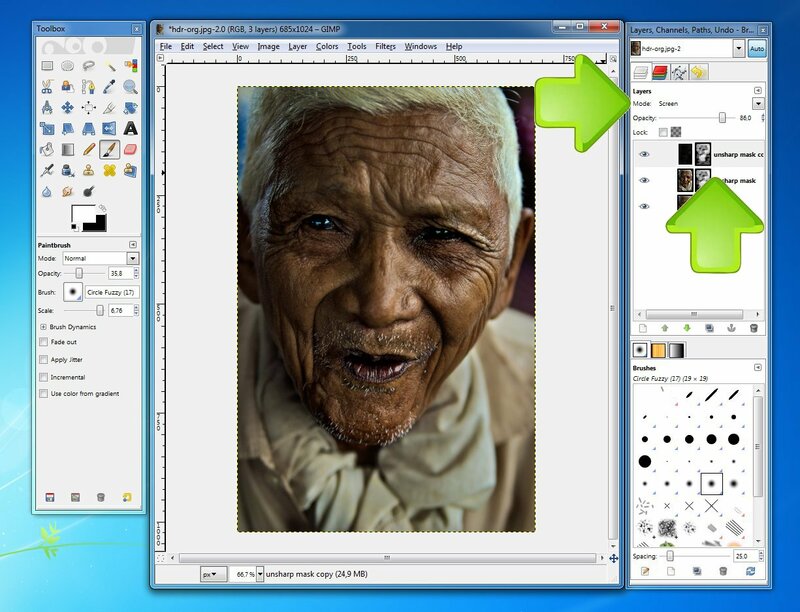 Create a layer mask for the “unsharp mask” layer, set it to black. 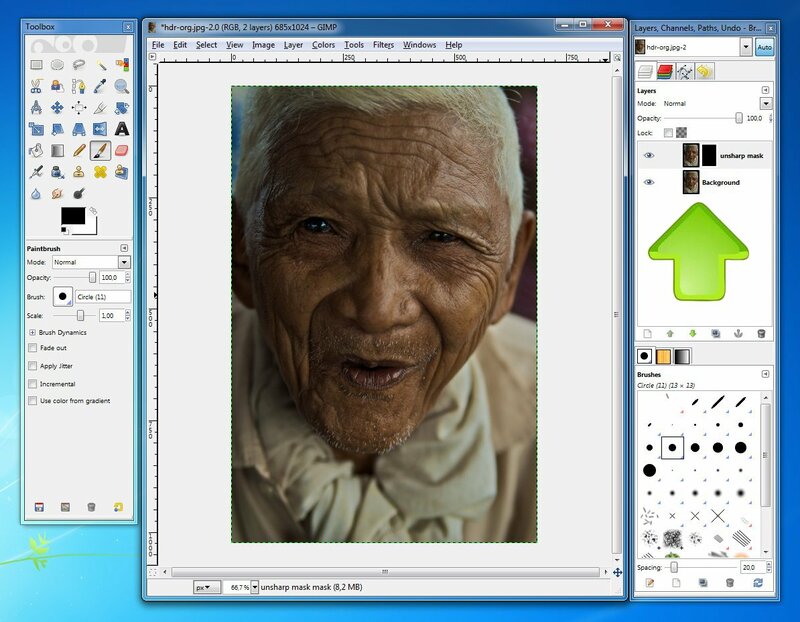 You do this by right clicking the layer and selecting “Add layer mask”. The layer mask now did so that noting is visible of what we just did! But that’s OK, we use a layer mask here to be able to control the effect a bit. By choosing a big wide paint brush with soft edges we can now select the black layer mask and paint white on it where we want the effect to be seen. By setting the opacity of the paint brush to about 30% we can also set how much of an effect we want for each place. Areas with many details as hair, beard and creases are really popping out with this effect so let’s paint those areas white. You can look at my layer mask where I did paint white. When you feel pleased with the effect, select the “unsharp mask” layer and duplicate it once again. Name the new layer “details”. With this layer selected, apply Filters > Edge detect > Neon. Set the Radius value fairly low and leave the Amount to 0. I choose a Radius of 2. The photo now looks very miss-colored but we will solve this by changing the layer mode from Normal to Screen. Directly we see a more balanced photo and we can adjust the strength of this effect by lowering the layer opacity if needed. Done! 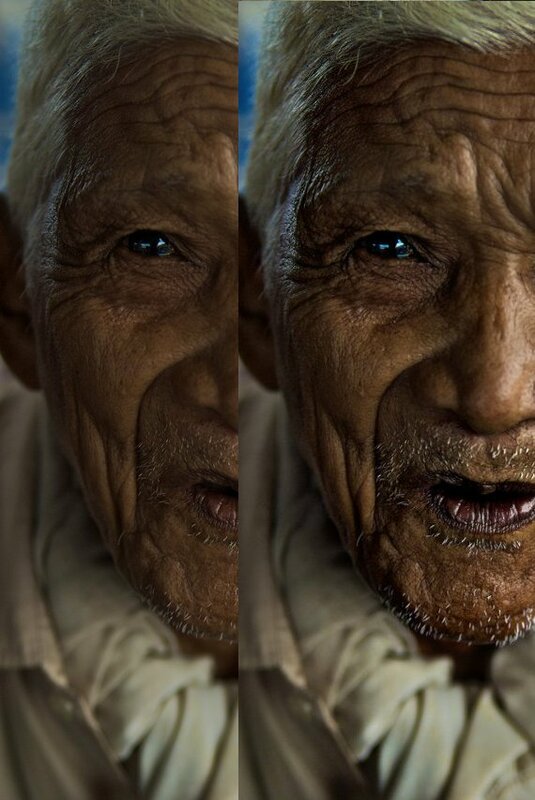 By placing the two images next to each other we can clearly see what difference the effect can do for the correct photo! I am starting photography and I was looking for a long time to know how to use the brush selectively two layers using Gimp. You’re so awesome! I don’t believe I’ve truly read through a single thing like that before. So good to discover somebody with some genuine thoughts on this subject. Seriously.. many thanks for starting this up. This website is something that is needed on the internet, someone with some originality!